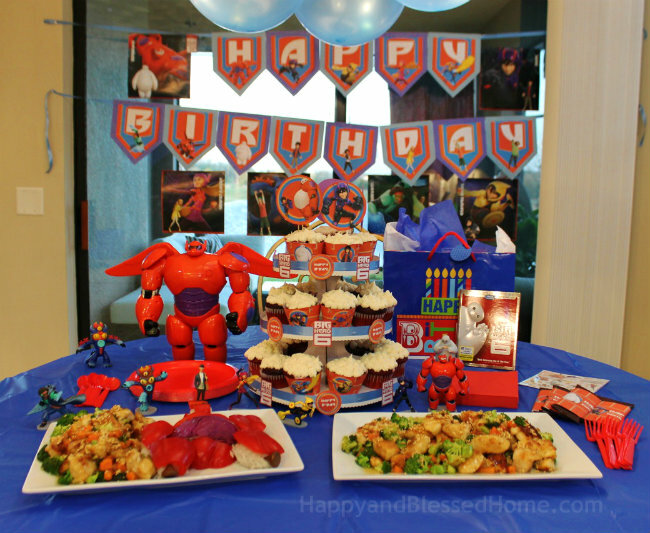 This post includes Big Hero 6 Birthday Party celebration ideas, information about the movie release of Big Hero 6 at Walmart, and my delicious recipe for Honey Lemon Chicken. I’m a big kid at heart. I truly enjoy Disney movies and especially the movies where the good guys prevail. Big Hero 6 is a great movie because it encourages viewers to find their inner superhero. Big Hero 6 is about a young boy who grows through personal loss and matures into a young superhero. 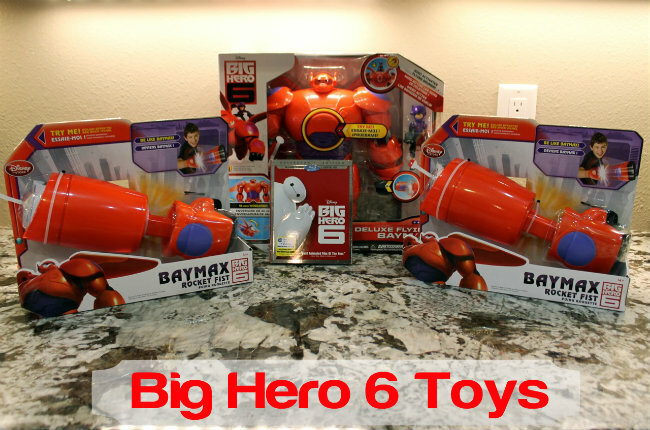 The Big Hero 6 DVD/Blu-Ray just released at Walmart along with some super fun toys for kids. The movie is PG so I suggest parents watch it before determining if it’s ok for their kids to watch. My little guys (ages three and four) are still a little young for the movie, but my family (outside the boys) loved watching the main character Hiro, an adolescent genius, and his lovable robot companion, Baymax, defeat the bad guy along with their friends Go Go Tamago, Wasabi, Honey Lemon (I created my Honey Lemon Chicken recipe in honor of this character), and Fred; who together form a band of high-tech heroes. 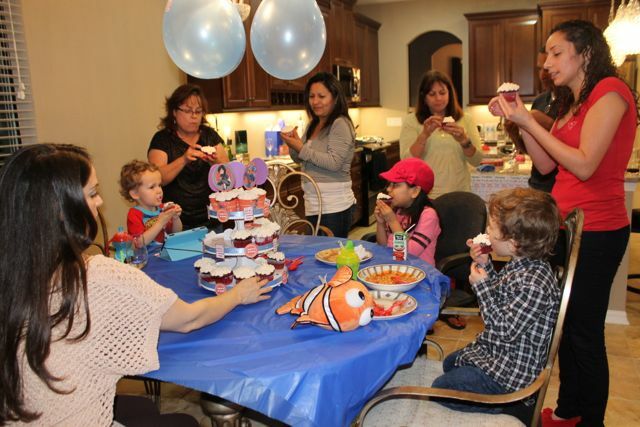 Our family truly enjoys throwing a party! For my sister’s 40th birthday the boys and I decided to throw a super fun Big Hero 6 party complete with red velvet cupcakes, Honey Lemon Chicken, and a rice side dish dressed up to look like Baymax. All the kids at the party were able to blow out the candles on their very own cupcakes, including my sister (who is also a big kid at heart). This shop was previously compensated by Collective Bias, Inc. and its advertiser. All opinions are mine alone. #BigHero6Release #CollectiveBias. I found everything I needed for our Big Hero 6 party at Walmart. You can order Baymax, Hiro and friends on Walmart.com. The paper printables were something I found online at an Etsy store and are not endorsed or provided by Disney. 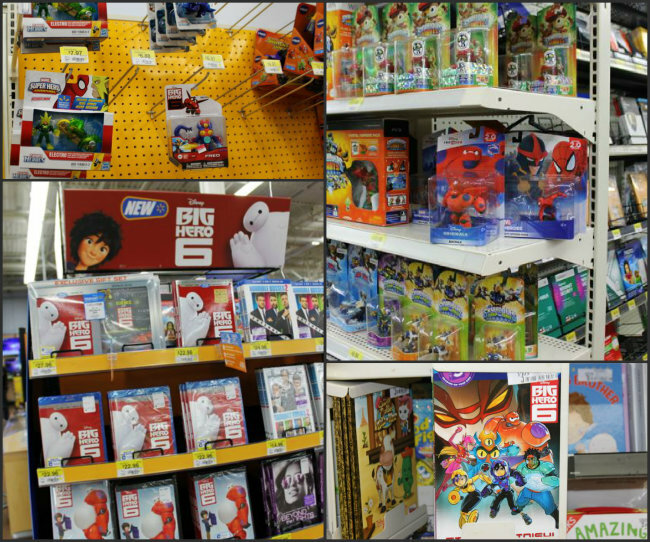 The Big Hero 6 stickers and poster are from Walmart. My favorite toy from the collection of Big Hero 6 toys online is the “Flying” Robot Baymax. He doesn’t actually fly but he makes some cool noises that make him sound like he’s flying – perfect for creating imaginative play! Purchasing toys online at Walmart.com is also a great way to save money. This Baymax toy retails for $50 at the Disney store but you can find it at Walmart.com for just under $35 (while supplies last). My boys also loved the launchable fist based upon the rocket fist on the robot Baymax. Great fun for little boys or girls. And again, you save money when you purchase it online at Walmart.com – The Baymax Rocket Fist is under $18 online at Walmart.com and sells for $25 at the Disney store. 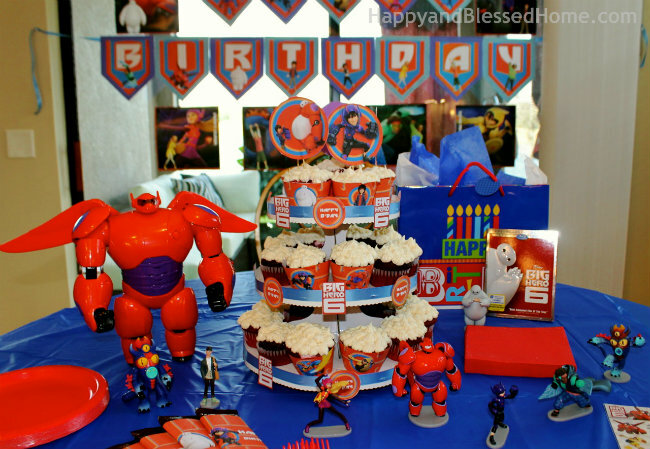 Our party guests loved the themed birthday party the boys and I threw together for my sister and they especially loved my Baymax themed party food. I shaped some white rice into a Baymax body and then created armor for the body using red cabbage and red bell peppers. So fun, and a great talking piece for the party! To assemble Baymax, simply shape the rice into a torso, arms, legs and head using your hands. Cut the bell pepper and red cabbage to fit as pictured here. Add chocolate chips for the eyes and feet and voila’ – you have an edible Baymax side dish! The most delicious dish at the party was my Honey Lemon Chicken recipe. This dish is the perfect combination of sweet and savory. It’s easy to make and it’s sure to become a family favorite! Step 1: Trim Chicken. 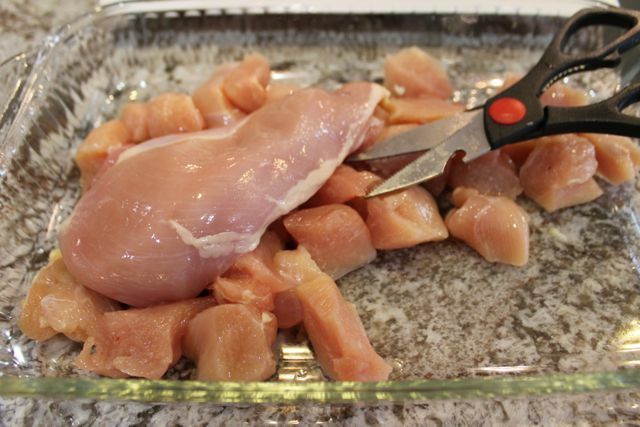 I like to remove all the fat and then cut the breasts into bite-sized chunks about 1 1/2 inches to two inches square. 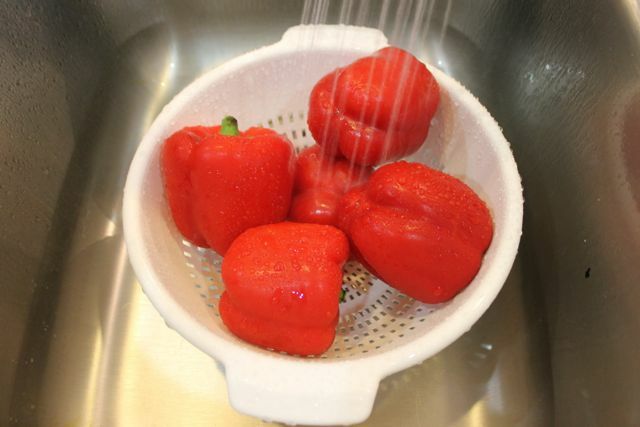 Step 2: Wash Produce. I always wash all the fruits and veggies before I start. 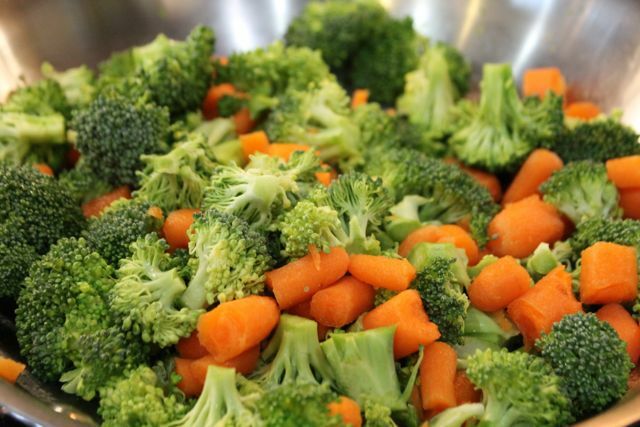 I cut the broccoli and the carrots into chunks before I started to cook. Step 3: Assemble Ingredients. 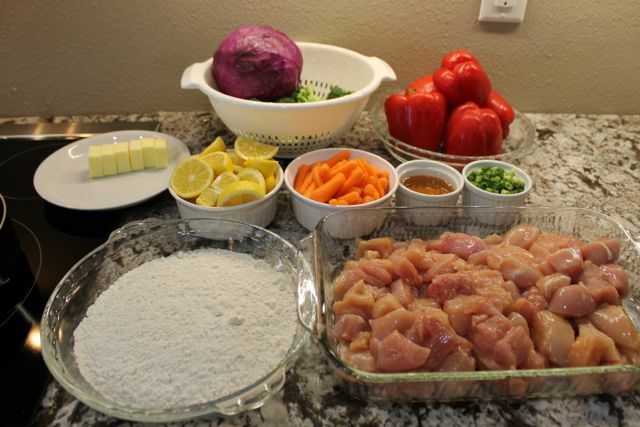 Gather all ingredients as shown and pour 2 cups of flour into a pie pan to prep for coating the chicken with flour. Step 4: Cook Rice. Bring 4 and 3/4 cups of water to a boil in a large pot. Once boiling add two cups of white rice. Reduce heat to a simmer and cook for 20-22 minutes. Check rice for done-ness at 20 minutes. Cook longer for drier rice and less for sticky or wet rice. Step 5: Heat Butter. Add one pat of butter to each one of two pans – one pan for your chicken and the other for your vegetables. I pan fried both the veggies and the chicken separately because I like my veggies on the crisp side and I did not want to risk my chicken being underdone. You’ll need to watch the butter and make sure to add your foods before it burns. I had the heat on level 4 when I started to cook and I staggered the cooking. I started cooking the meat first and then cooked the veggies slightly behind the chicken. Step 6: Flour the chicken. I used my fingers to roll the chicken gently through the flour. This dish does not need any other seasonings added to the flour. You want an even coat of flour on the entire surface of the chicken. Step 7: Pan fry the Chicken. 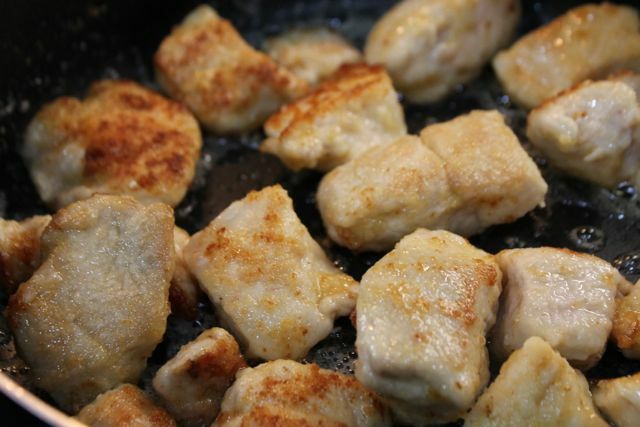 Once the butter starts to brown, add your floured chicken pieces to the pan. I hovered between a level 4 and 5 heat on the stove top. You’ll want to cook the chicken somewhere between five and six minutes on both sides. If you’re unsure, just take a piece out and cut it open to check for done-ness. Stovetops vary widely so aim for a medium heat and keep an eye on the chicken. Since this recipe includes a chicken package for five lbs. of chicken I cooked this batch in three loads. Step 8: Pan fry the Vegetables. I tossed the veggies as I fried them in the brown butter. I like mine crispy so I only tossed the veggies for about seven or eight minutes total on a medium temperature. Step 9: Brown the Sesame Seeds. 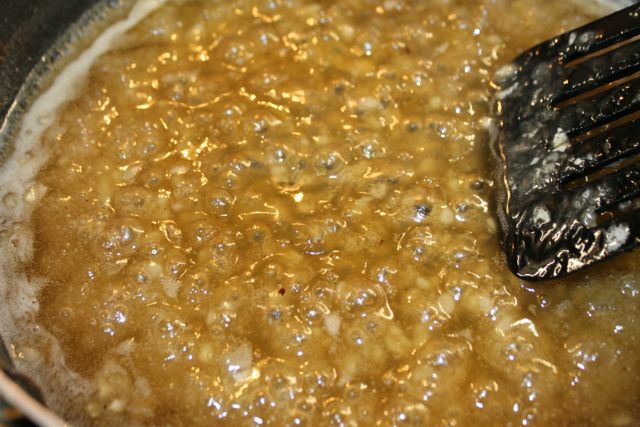 To brown the sesame seeds, I took a 1/4 inch pat of butter and melted it on a pan. I swished the butter around and dumped the extra butter into the chicken pan to ensure a nice thin layer on the surface of the pan. Be careful not to burn the butter. I then sprinkled the sesame seeds on the surface of the pan. 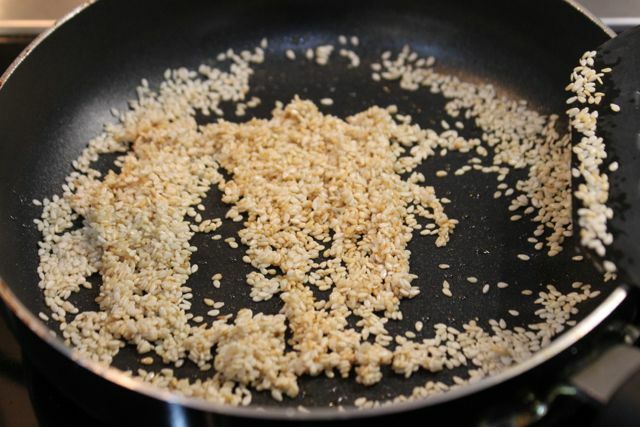 Keep the pan on a medium to low heat and brown the sesame seeds slowly. Flip them once one side has browned and remove them as soon as they are browned on both sides. 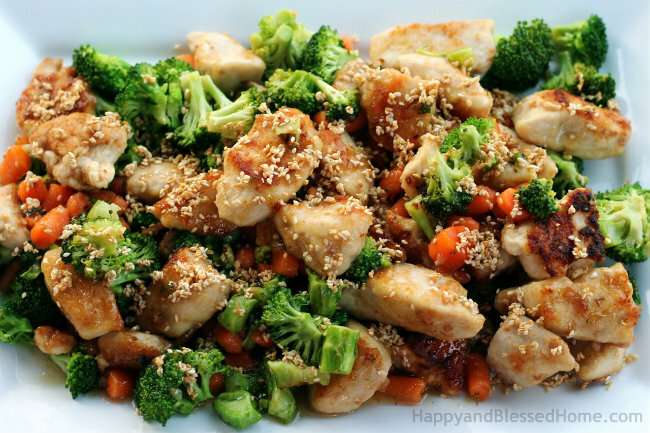 As you’re cooking all there elements – sesame seeds, vegetables, and chicken, keep an eye on the chicken and take each batch off the burner when it starts to brown and looks like the chicken pictured here. Step 10: Cook the honey lemon sauce. For the sauce I used the same pan that I’d used for the chicken and any leftover bits of chicken and butter in the pan. Heat was at a 4.5 level. I added 12 ozs. of clover honey and squeezed in the juices from the hunks of lemon I’d cut from three fresh lemons into the frying pan. Once things statred to bubble I mixed in two teaspoons of flour to create the sauce you see pictured here. 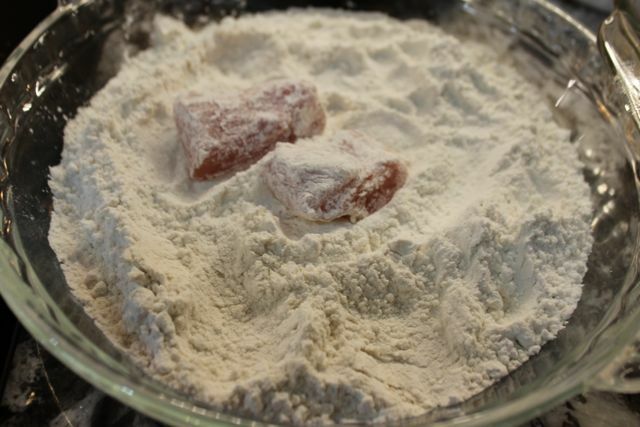 As soon as the flour has melted into the sauce, you can use it to coat your chicken and vegetables. Step 11 Pour the sauce. 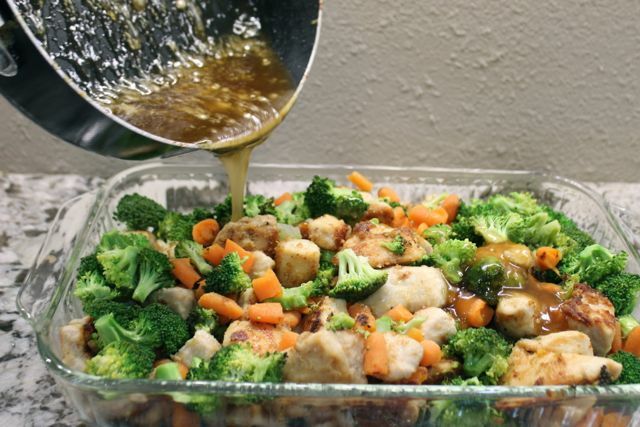 Pour the honey lemon sauce over over the chicken and veggie’s and slowly and gently toss the chicken and veggies in the sauce to coat everything. Step 12 Add Sesame Seeds. Sprinkle your sesame seeds onto your Honey Lemon Chicken dish and enjoy a feast for your eyes and delicious flavors for your taste buds. A cupcake tower is a fabulous way to create a fun and festive cake display. Just think of all the possibilities! You can bake different flavors of cupcakes, use various types of frosting, and/or decorate with cupcake toppers and cupcake wrappers. 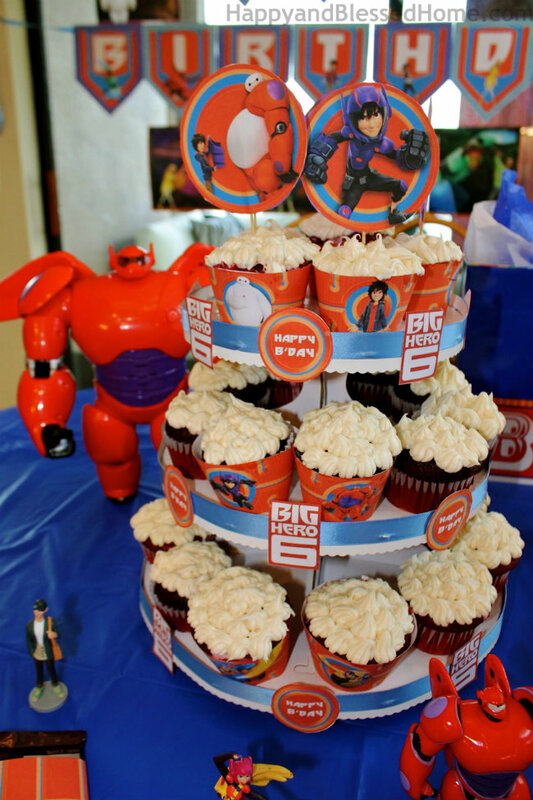 I purchased a blank cardboard cupcake display at Walmart and then decorated it with the Big Hero 6 printables I found online at an Etsy store. The printables from Etsy are not endorsed or provided by Disney. 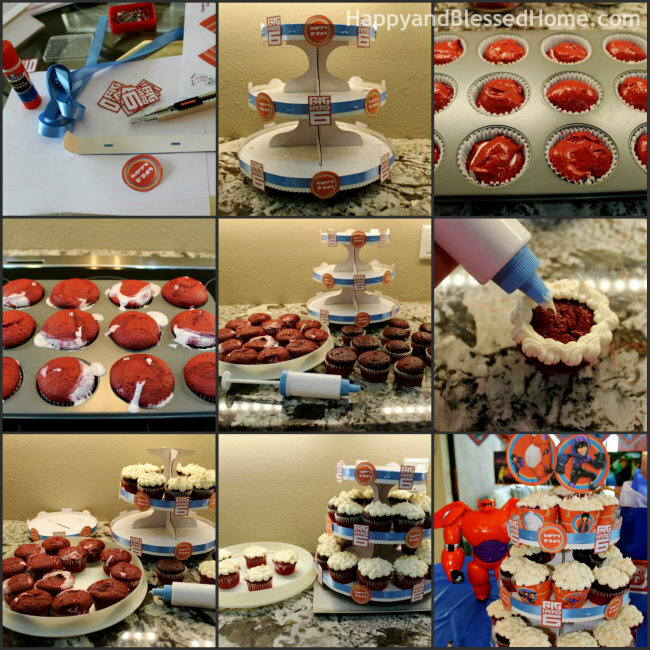 To create our cupcake tower I baked red velvet cupcakes with cream cheese filling and decorated them with cream cheese frosting. The cupcake wrappers and toppers featured all 6 of the Big 6 superheros including: Hiro, Baymax, Go Go Tamago, Wasabi, Honey Lemon, and Fred. 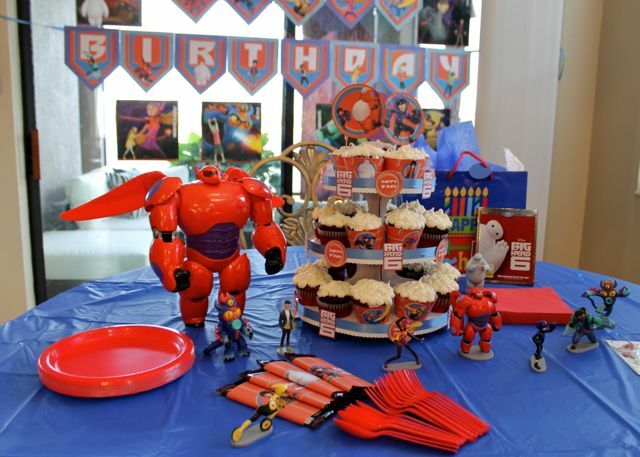 Guests enjoyed watching the kids play with the Big Hero 6 toys, and they loved the fabulous food, party decor and time together visiting as friends. 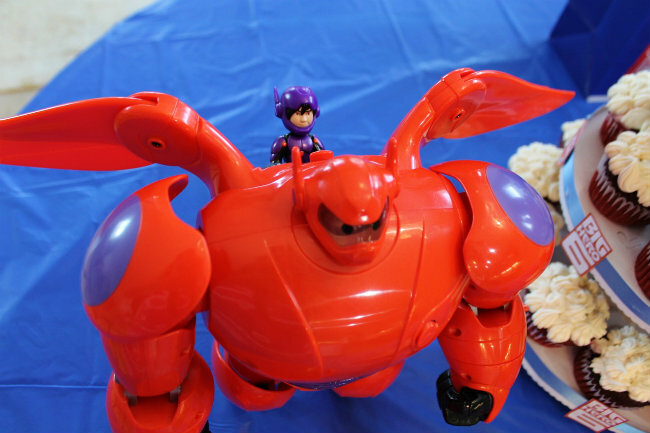 A Big Hero 6 Birthday Party and DVD Movie Release is a great way to gather with friends and celebrate milestones. I hope you found some inspiring ideas for your next superhero birthday party. Who is Your Favorite Disney Hero? Does your family have a favorite Disney hero? What’s your favorite way to celebrate a birthday or movie release? Please leave a comment below, I always love hearing from my readers. Thanks for being a fan! Do you have a board for kid parties or birthdays and/or delicious recipes on Pinterest? Help spread the word and PIN this post on Pinterest! We love Simba and the Lion King! We just watched the musical show at Disney’s Animal Kingdom on a trip to FL recently – but you’re right Big Hero 6’s Baymax is an awesome Disney Superhero too! That chicken recipe sounds delicious! We love Big Hero 6 here. Honey Lemon is my personal favorite sidekick 🙂 I can’t wait to try this recipe the next time we have a movie night! Thanks Adelina! My family loved the recipe and it’s now a part of our regular family favorites. Enjoy! First of all – amazing post! The movie sounds so fun! My kids are a little older (12 and 15), but I miss those days of going to see the newest Disney movie! 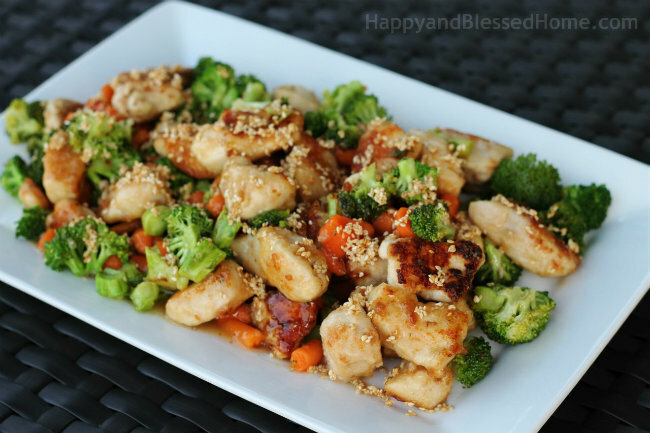 Your honey lemon chicken recipe looks AMAZING! I love anything with sesame seeds!! Thanks for the compliment Terri. I think your kids are the perfect age for the movie 🙂 I love how it inspires us to find our own inner superhero! We just watched this movie last week and absolutely adored it. Your dinner looks very tasty too. Thanks Maria. It’s an inspiring movie – great for some family fun! Great party! 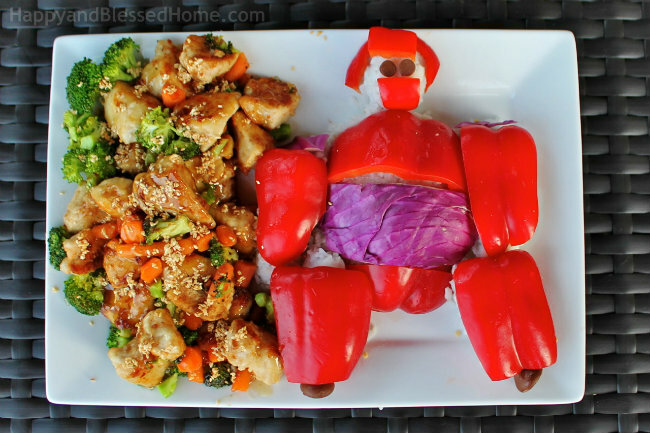 We are huge fans of Big Hero 6 and I love your ideas, especially the red bell pepper “Baymax” is so creative. 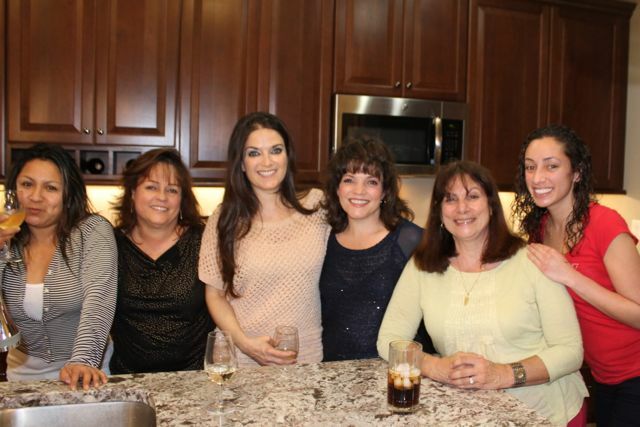 Looks like a wonderful birthday party with great food and good friends. Thanks Andrea 🙂 Yes – the bell pepper Baymax was a conversation starter at the party and it’s nice to meet another Big Hero 6 Fan!